The first possible time target coming out of the 2009 low was 2015.75 for the Dow to reach a Phase Transition and then a crash and burn. We stated in 2011 that the market was off to new highs, and Barrons even covered that forecast more as a curiosity. We have constantly warned that the Phase Transition was not confirmed yet. Indeed, the Phase Transition clearly shifted back in 2014, and appeared to be postponed into 2017. The three price targets were 18500, 23000, and the 30000–40000 extreme target. 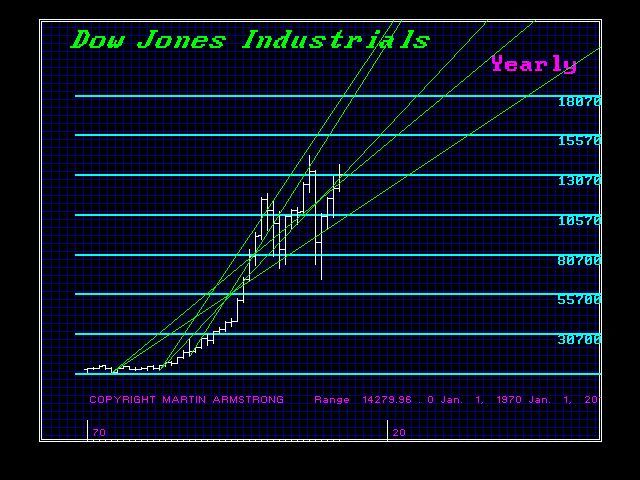 At the beginning of 2015, we warned that it did not appear likely that the market would exceed 18500 on the Dow, as it appeared that it would crawl along resistance forming a high in May. So far, that has been the pattern. Now the question confronting us is how long of a contraction do we see. A False Move must take place with a minimum of two to three months, which suggests an August low. If we see lower lows intraday or if September closes lower than August with a new intraday low in the Dow (not NASDAQ), then we may have a different pattern ahead. Nonetheless, if this pattern with an August low holds, then we may be off to the Phase Transition coming out of the hole. This would be confirmed by electing Monthly Bullish generated from an August low. In terms of price, we should be aware of this pattern development by exceeding 18500. The next hurdle will be 23000. Exceeding that level will put us into a Phase Transition, and the extreme target in the 30000–40000 level will result in a disastrous outcome. This would most likely be coupled with gold as all tangible assets rise when driven by the shift from public to private. This is the pattern and the requirements to see that unfold. It is not a forecast and should not be seen as a promotional forecast like the gold promoters. If you do not understand this type of analysis, you are not ready for the professional level, so go back to your normal viewing channels — this blog is obviously not for you. You belong in the guru follower circuit. « AT&T: The Biggest Traitor to the American People?